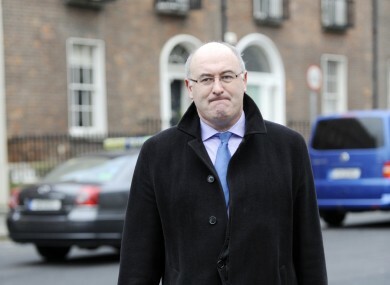 THE DEPARTMENT OF the Environment has already received so many household charge payments by post that staff have not had time to open them all, Minister Phil Hogan has said. He said the cheques and money orders were sitting in “57 black sacks” waiting to be processed. The Government expects a last-minute rush before Saturday’s deadline for the payment, Hogan said. It emerged yesterday that three quarters of homes are yet to pay the charge. There are 57 black sacks of envelopes that have arrived in the last couple of days. Speaking on Newstalk Breakfast, Hogan said 83 per cent of payments so far had been made online. But he said the option for postal payment meant that even those without internet access are not put out. “If people are able to write on an envelope, they’re able to pay the household charge,” he said. The Government has said repeatedly that it intends to replace the household charge with a means-tested property tax in 2013 or 2014. Email “"57 black sacks" of household charge payments already received - Hogan”. Feedback on “"57 black sacks" of household charge payments already received - Hogan”.